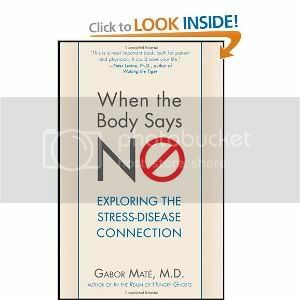 I just read a book that I would recommend to anyone, WHEN THE BODY SAYS NO. The concept of rejecting the idea of positive thinking is at the end of the book, but it’s one of my favorite premises of Gabor Mate, M.D. He makes a compelling argument that positive thinking clouds over the issues and that if you don’t deal with them, you’re living in delusion — a similar sentiment to what I wrote in my blog about Wayne Dyer, PhD. It isn’t actually that Dr. Mate wants people to think negative, but instead that an honest assessment of the problem, which by its very definition would be considered negative, is essential to the remedy for it. Dr. Mate even suggests that happy children may be children that are trying to appease unhappy parents. Smiling kids, according to him, may grow up to be unhappy adults. You are empowered by your ability to see through self-delusion of your own making. It’s easier to remember our childhoods for the good times and ignore the bad. But no one had a perfect childhood. It’s just not possible, because different children need different nurturing and parents are not psychic. So parents, even the good ones, made mistakes that you will spend a lifetime fixing — or not. Compulsive optimisim is unrealistic. Life is difficult. Think negative. What is wrong and how can you fix it? And ultimately the topic of this book is that unresolved issues make you sick. And sometimes kill you. When all the time, you have the power to change by facing the ugly truth of when you acted like someone else wanted you to and not the way you felt. Since every time you are unauthentic, you undermine yourself just a little. And it builds. And now you’ve undermined yourself a lot. Many of his cancer patients say the same thing: But I am a good person. I took care of myself. I ate the right foods. And, your point is? Do you really think that’s all you have to do in life? Just be a good person. Life is complicated. And it’s meant to be. You’re here to learn things, not just eat and that other thing. Every time your body is saying no by an uncomfortable physical display, it is telling you something. And it is worth taking the time, even if it is just a headache, to figure out what it is saying to you. But even if you have allowed the unresolved issues to become a genuine illness, it isn’t too late. You still can, and should, take the time to ask yourself what might have been going on behind the scenes. And it will have nothing to do with how good you are. It will have everything to do with things that you don’t address, because some ingrained behavior from your “perfect” childhood has led you to believe that ignoring an uncomfortable issue is okay. Pretty much, if anything makes you squirm, you need to stand up to it. It’s your silence that is your killer. And you will be comforted by the fact that you don’t have to fix anyone else — just yourself. Could it be any easier? Oh yeah, you could just think positive and wish it away, except when was the last time that worked? I was dating someone and my neck kept hurting. He said I must be getting old at 48… lol; now I’m 50 and my neck is fine. It was stress from dating this man for 13 months.. it cleared up.. was not from aging that year. I had to address that Love was NOT enough; this man was waaaaay to pessimistic…… and i felt drained; and his last name rhythm with Neck… lol.. I lost weight too from having dated him.. Being upbeat and positive that we could make it work; was not good; getting negative and saying this is not working;.. worked out better.